Since starting this site at WordPress.com over a year ago, and since transitioning to a self-hosted site earlier this year, my thinking about the structure of the Free Lutheran Chorale-Book has developed dramatically. The goal has remained constant: To provide unlimited free access to high-quality resources devoted to the singing of the great Lutheran chorales in English. How to achieve that goal is another question altogether. Due largely to the nature of WordPress.com, the site started out pretty much as a blog. Each post was really supposed to function as a permanent page, serving as a gateway to all of the resources associated with a particular hymn, including English and German texts, audio files, and printable PDFs. Post categories served to organize hymns according to the church year and various topics. This design, or lack thereof, proved hopelessly confusing. A casual visit to the site left visitors with no clear idea of what the site was for or how to access materials. This necessitated a major redesign. A new homepage now served as a launchpad for access to hymn text pages with looped audio to promote singing of all the stanzas. In this way the site began to function more as an online hymnal, particularly when accessed from a mobile device. Other elements were then changed in keeping with the new philosophy. The older blog posts were reimagined as “Hymn Info” pages, with links provided at the bottom of the text pages. Eventually, it became clear that there would have to be distinct pages for tunes. These can now be accessed both through a link under the audio player on the hymn text pages and via the tune indexes in the main menu. Unfortunately, conceiving of the site as chiefly an online hymnal left the printable resources difficult to find: They were hidden away at the bottom of their hymn text pages. This has been addressed by moving the links to printable materials above the audio player. It had been feared that this would be too obtrusive, particularly when using a mobile device to sing the hymns from their text pages. In practice, however, the printable resources at the top of the page take up very little space. The site still functions nicely as a mobile online hymnal. That still leaves us with a number of blog posts which remain as nothing but leftovers from an obsolete vision of what the site should be. Eventually the research found in the posts will be transferred to distinct “Text Info” pages, parallel to the existing “Tune Info” pages. This opens up the possibility of using the posting functionality for an actual blog. 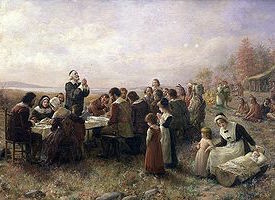 Hence the Free Lutheran Chorale-Blog. I plan to publish posts regularly, and I hope for them to function as posts, not as substitute pages. 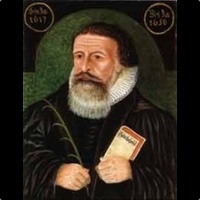 These posts will serve to publicize news related to the Free Lutheran Chorale-Book, draw attention to notable additions to the site, serve as a venue for discussion of problems and philosophies involved in development, and whatever else doesn’t seem to fit in the Chorale-Book proper. Hopefully regular posting will also be a visible testimony to the fact that development on the site is constant and ongoing. Check back regularly for new posts, and if you’ve been using and benefiting from the Free Lutheran Chorale-Book, thank you! This entry was posted in Articles on August 4, 2014 by Christopher Neuendorf. Last night I tried singing through all of Luther’s psalm settings that I’ve put up here so far, using the audio player that I’ve embedded in the hymn text pages, and I noticed something interesting: “May God Bestow on Us His Grace” was the only one with a singable tempo. 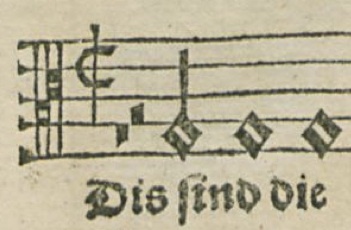 With most of the audio files I’ve put up here, I’ve followed the convention of representing sixteenth-century semibreves with modern half notes. Assuming that each semibreve/half note corresponds to one resting heartbeat, I have given each hymn in cut time, “alla breve,” which is the time signature actually used in the sixteenth-century hymnals (a “C” with a vertical line through it), and I have assigned each half note the value of 90 BPM—a decidedly unhealthy resting heart rate. When played with a healthier heart rate of more like 60 BPM, these hymns really drag. So I’ve already been pushing the tempo, probably well beyond what would have been used in the sixteenth century, if I’ve understood it correctly. The opening of “These Are the Holy Ten Commands.” The hymn is in cut time. The two rests, semibreve and minim in value, when added to the minim pickup note, come to one breve, which I identify with one measure. The rests are not necessary for performance. I therefore take them as giving the singer a sense of where the pickup note falls in the metrical structure. So now I’m reconsidering the whole question of tempo. Everything I’ve read has told me that the semibreve in the sixteenth century stands for one at-rest heartbeat, and this has just proved to be impossibly slow in practice. But what if the heartbeat is supposed to correspond, not to the semibreve, but to the breve (which we represent with a whole note)? After all, the breve was the standard measure at the time. Most hymns provide however many rests before the opening pickup note as may be necessary to bring the value up to one breve, even if those rests are not to be observed in practice when the A section is repeated. The hymns are also notated in cut time, “alla breve,” or “to the breve.” It makes sense, therefore, to view the breve as the basic unit of measurement, and for the basic unit of measurement in the notation to correspond to the basic motion of the human heart. If the breve corresponds to the heartbeat, and if each breve is divided into two semibreves, representing the downbeat and the upbeat, then each semibreve would correspond to either the systolic or the diastolic division of the heartbeat. Lub-dub, lub-dub, lub-dub: God’s free grace and favor. Makes perfect sense. The implication for tempo would be that each measure of two beats would be played at about 60 BPM. Each half note (semibreve) is then played at about 120 BPM, each quarter note at 240 BPM. I propose, therefore, to overhaul most of my hymn audio files, playing each measure at a rate of 60 BPM, with each half note being played at 120 BPM. This goes against everything I’ve read about sixteenth-century tempos. Experts in the field of mensural notation will laugh at my amateurish attempts to deal with this deviously difficult system of notation. But the results will be singable, and that’s what matters. This entry was posted in Articles on February 16, 2014 by Christopher Neuendorf. This entry was posted in Articles on November 28, 2013 by Christopher Neuendorf.